Jefferson City, Mo. - Missouri's top insurance regulator on Tuesday met with seniors in Jefferson City as they received help from counselors in choosing Medicare plans. State Insurance Director John M. Huff visited an open enrollment event at the Goldschmidt Cancer Center, where Medicare recipients and their families got expert assistance in deciding which Medicare Advantage and Part D prescription drug plans best fit their needs. The counselors are from the CLAIM program, funded by Medicare and the Department of Insurance. CLAIM exists solely to provide free, unbiased counseling for Missourians with Medicare. Recipients are in the process of selecting new Medicare plans for the coming year during the annual open enrollment period, which runs from Oct. 15 until Dec. 7. "This event is a valuable public service for Medicare recipients, who face an extensive array of options when it comes to enrolling in health insurance plans," said Huff. "Our expert CLAIM counselors prove time and again that Medicare enrollment doesn't have to be a stressful time. They can narrow down the options and help consumers make an informed decision in a short amount of time." Huff encourages all Medicare recipients to take advantage of CLAIM counselors and review their options every year, even if they're happy with their insurance plans. He says rates and drug formularies change frequently, and shopping around can mean big savings. CLAIM counselors will also be at the Goldschmidt Cancer Center, 1432 Southwest Blvd., from 10 a.m. to 3 p.m. Wednesday, Nov. 9. Appointments are preferred, but walk-ins are also welcome. The Jefferson City sessions are two of more than 100 open enrollment events being offered by CLAIM across Missouri this year. For a full list, to make an appointment, or to set up one-on-one counseling, consumers can contact the CLAIM program at 800-390-3330 or visit missouriclaim.org. Top photo: August Dudenhoeffer, left, speaks with Insurance Director John M. Huff during a CLAIM open enrollment event. With them are CLAIM manager Jim Day, second from left, and volunteer counselor Dennis Gillis, right. 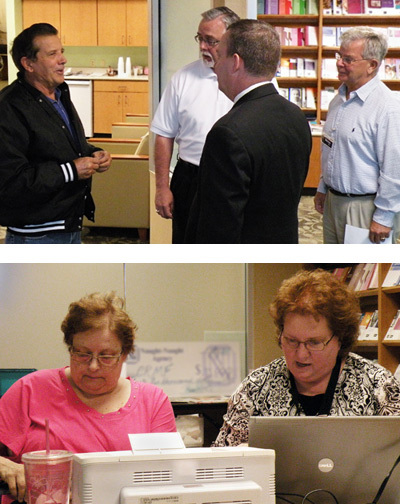 Bottom photo: CLAIM coordinator Judy Keseman, right, helps a consumer research her Medicare plan options.